The controls in this tab are numerous and as such it can be quite daunting but each control is explained in full below. Allowed Searching Threads: This is how many threads will be used for searching. It is adivsable to not let this go higher than 1 for every 5 proxies being used for searching though that is the absolute maximum I would use it is still best to keep it 1 searching thread for every 10 searching proxies. If you are not using proxies definitely leave this at 1. 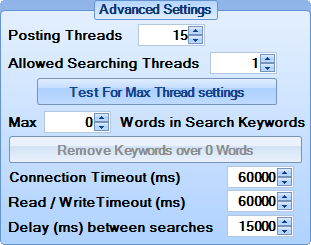 Test ForMax Thread Settings: Clicking this button will bring up the Maximum Thread Checker for determining the maximum amount of threads that your connection can handle. Max X Words in Search Keywords: When No Hands SEO has done searching the keywords that are entered in for your profiles it will begin to find keywords related to those keywords, setting this value will limit the keywords to this many words. This can be useful as generally search phrases with more than 3 words will return very few traget pages when searching. Connection Timeout: This is a timeout that will be used when downloading webpages. This is in ms.
Read / Write Timeout: This is the maximum time allowed to download the webpage once it has made the connection. This is in ms.
Delay between Searches This is a delay set between each search per searching thread. This is in ms.
Minimise to system tray: Enabling this will make NHSEO minimise to the system tray so it can run in the background. Check Posts For Links: Leaving this enabled will allow No Hands SEO to check when a successful post resulted in a live link. It is advised this be left enabled otherwise it may appear that no links are being created. Broad Keyword Search: Searching will be done without quotation marks ensuring the most targets possible. This can be used with exact keyword search. Exact Keyword Search: Searching will be done with quotation marks ensuring more relevant targets but less targets overal. This can be used with broad keyword search. 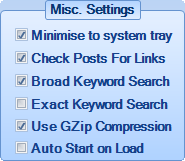 Use GZip Compression: Enable GZip compression to lower the amount of bandwidth used when posting. Username / API Key: If you are using an online service you will need to enter in at least either a username or an API Key. If your service uses an API this label will change to API Key, if it uses a username for login this label will read Username so you always know which one is needed. 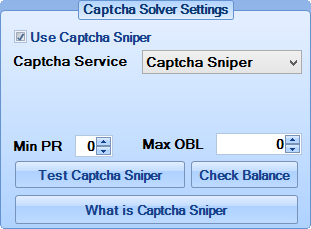 Min PR: Setting this will prevent captcha solving depending on whether the target page meets the desired PR setting. Max OBL: Setting this will prevent captcha solving depending on whether the target page meets the desired Outbound Link setting. Max Outbound Links: Setting this will prevent posting if the page has more outbound links than the value you enter. Prevent Posting to Root Domain: It is strongly advised that this option always be enabled as it prevents multiple posts to every domain. If this is disbled NHSEO will post multiple posts to different pages on the same domains, it could mean far less links overall. This control is used for wiping past failed post information from your database and then reclaiming the unused space in the database. It is highly important that you not attempt to close NHSEO while this process is still running, when it is fully finished there will be a note in the Log that the database maintenance has finished. Clicking this will post some debug information to the Log. This is only really used to try and figure out what is happening if an unexpected error occurs.